Recorded as Hogg, Hogge, the diminutives Hoggett and Hoggin, and the patronymics from the diminutives of Hoggetts and Hoggins, this is a surname of Anglo-Scottish origins. It has two possible meanings. The first being that it is a metonymic occupational name for either a swine-herd or a shepherd. This is from the middle English 13th century word "hog", meaning usually a pig, but also a young sheep, a hoggit. The second possible origin is from an Old English pre 7th century word "hoga", meaning careful or prudent, and it is thought that this surname at least in some cases, may be a nickname surname to describe such a person. The Gaelic form is "Mac an Bhanbh", meaning "son of Hogg", and the name is well recorded in Scotland, where they seem to have been prominent and wealthy members of society throughout the ages. The name was introduced into America in 1635, when a Mr James Hogg is recorded as being the master of the "David". This ship sailed from the port of London to Virginia on September 2nd of that year. Other early examples of the surname recording include those of Henry Hogget, at St Dionis Backchurch in the city of London in 1627, and Eliza Hogins or Hoggins, who married James Alin at St James church, Dukes Place, Westminster, on February 4th 1668. 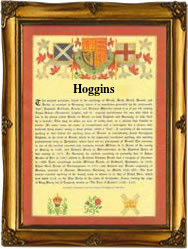 The first recorded spelling of the family name is shown to be that of Ailmer Hogg. This was dated 1043 a.d., in the register of Ramsey Abbey, during the reign of King Edward of Egland, known as "The Confessor", 1042 - 1066. Throughout the centuries, surnames in every country have continued to "develop" often leading to astonishing variants of the original spelling.